To Cite: Mousavi S S, Chaman R, Mohagheghi P, Mousavi S A, Khosravi A, et al. Development of a Support System for Parents of Premature Infants, Iran J Pediatr. 2017 ; 27(6):e9578. doi: 10.5812/ijp.9578. Background: The concept of family-centered care is increasingly being recognized at the international level. Objectives: Development of a support system for parents of premature infants (PPI), based on family-centered care and scientific evidences. Methods: The method is based on four key steps. 1) Explaining parents’ needs, including comprehensive review of quantitative studies, meta-synthesis of qualitative studies conducted in Iran by search of Iranian databases (IranMedex, Magiran, and SID) and international resources (PubMed, Scopus, and Google Scholar) and comparative study. 2) A comprehensive review to identify effective interventions in supporting PPI and ranking interventions. 3) Designing a model to support PPI. 4) Evaluating designed system for supporting the PPI. Results: The results of this study identified five critical steps which the PPI experienced and 14 effective interventions to support them. Preconception: care before the next pregnancy; prenatal: preparing parents to see their baby for the first time, supporting parents in breastfeeding (BF), kangaroo care (KC) and infant massage; neonatal: spiritual self-care, individualized behavioral and developmental care programs, using scales to assess infant's behavior, supporting parents in BF, KC and infant massage, support forums for parents, relieving parents’ stress, sharing information and communication, family nurture interventions, supporting parents in transferring between neonatal units (NU), facilitating collaborative care in NU; discharge: discharge planning, support forums for parents, sharing information and communication and home: home support programs, individualized behavioral and developmental care programs, supporting parents in BF, KC and infant massage. Support forums for parents, sharing information and communication. Conclusions: Our proposed system provides a parent-centered system which can be implemented to provide high-quality care for PPI. Although technological advances have resulted in the survival of a higher number of premature infants, complications are still high and huge financial and emotional burdens continue to weigh heavily on the shoulders of families and the health care systems (1). Premature birth has some psycho-social consequences as it leads to “premature parenting” in which the expectations of the mother for “normal” pregnancy and giving birth to a healthy baby are not met. Pregnancy duration allows for emotional adjustment with the changes of pregnancy and preparation for parenting (2). Parents of premature infants (PPI) are deprived of this adjustment opportunity and often experience a high emotional stress during the infant’s residence in NICU. They also experience high levels of depression and anxiety and change in parenting patterns until these children go to elementary and preschool. Interventions to enhance parents’ adaptation to premature infants have not developed along with the rapid development of technology for the survival of these babies. Among different interventions which have been tested on parents, most of them begin at the time of discharge or shortly after that; when the negative consequences of parents’ mental health has changed parents’ understanding of their baby and inefficient patterns of parent-infant interactions are formed (3). Items such as recognizing the critical stages of parents’ life with premature infants during the course of care, parents’ needs, and emotional impact of this event on parents and individual differences of parents in response to this event are among the recommendations for family-centered care (4). Despite emphasis on family-centered care, its implementation is challenging. While, there are many references on parental experiences, there is no powerful synthesis of these evidences to direct the development of future services and influence the development of parent-centered services; therefore, this study aimed at developing a support system for PPI, based on family-centered care and scientific evidences. 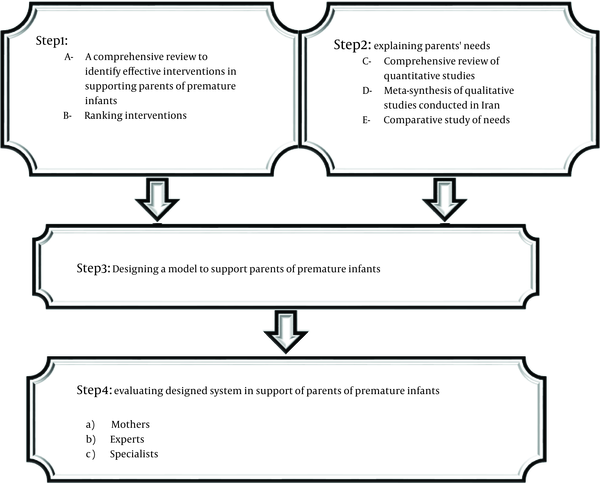 In order to develop a support system for PPI, four key steps were conducted which include: explaining parents’ needs, systematic review of literature to identify effective interventions in supporting parents of premature infants, designing a model of supporting PPI to take care of their babies and evaluating the designed system. In this section, we describe the methodology of each step (Figure 1). In order to explain parents’ needs, three stages were performed which include a comprehensive review on quantitative studies, meta-synthesis of qualitative studies and a comparative study of the needs. Brief descriptions of these stages are presented below. Systematic review of quantitative studies: a systematic review was conducted in national (Iran Medex, Magiran and SID) and international sites (PubMed, Scopus, GoogleScholar) with no time limit and data were updated at October 5, 2014. All the quantitative studies which utilized standard tools to consider the needs of parents with premature infants were included in the review. After qualitative assessment of these articles, 31 articles were selected and 17 of them were included in the meta-analysis based on the purposes of the study. The articles had been working in the following countries: Iran, Canada, United States of America, Netherlands, Sweden, Hung Kong, Italy, Thailand, Czech Repub, Brazil, Australia, England, Germany. This part of the study is described in details in a separate article (5). In this meta-synthesis, 16 qualitative studies have been conducted to examine the experiences of Iranian parents. National (Iran Medex, Magiran and SID) and international databases (PubMed, Scopus, GoogleScholar) were scrutinized in this regard. This part of the study is described in details in a separate article. At the third step, a model was designed to empower PPI to take care of their babies. To design the support model for PPI, the findings of two previous stages of research were integrated under the guidance of professors of research team and the model was designed. At the fourth step, designed system to support PPI was evaluated by mothers, experts and specialists separately in order to empower these parents in taking care of their babies. At this point, panels were held with several experts who were asked to score the interventions. In the intervention table, nominal group technique (NGT) was used to enhance the accuracy of the priorities. In this table, the prioritization criteria including relevance, availability of resources, cost-effectiveness and acceptability were written against each intervention; each priority could be given a score from one to three and those interventions which acquired 60% of the total scores remained in the model. The results showed that from the mothers’ perspective all the support areas are highly important; however, they ranked them in the order of importance as follow: instrumental support, informational support, emotional support and ultimately appraisal support. Despite the perceived importance of parents of different areas, they did not have a satisfactory evaluation of receiving support in different areas. Except for instrumental support, they evaluated receiving support from other areas as average and believed that the most neglected area is emotional support. Also they believed that the needs in the area of assurance are the most important thing that its realization can satisfy them during hospitalization of their infants in NICU. The other items included: the need for awareness, proximity to the infant, support and comfort were other important areas respectively. Meta-synthesis showed five related metaphors emerged from 13 categories and 78 integrated codes. Metaphors implied the needs of PPI in the areas emotional, informational, communicational, instrumental, appraisal and spiritual supports which in many cases overlap and are not distinguishable easily. Obtained categories include: cultural challenges of parental role, sparks of progress of parents against mental stress, psychological stress stimuli, economic challenges of parental role, physical damage, the need for family-centered care, the need for policymaking in the area of constant presence of parents in the NICU, spiritual prosperity against spiritual cultural inferiority, spiritual self-care against spiritual self-harm, guided participation in infant care, playing the parental role more efficiently, information challenges of parents and informational-communicational supports. After completing the two initial parts of the project, through using comparative tables, the results and findings of these two sections were integrated in the area of the needs of PPI. The results of the studies of this stage are presented in Figure 2. In the next stage, with the help of these interventions and through integration of the findings of previous stages of research, the model was designed under the guidance of the professors of the research team. 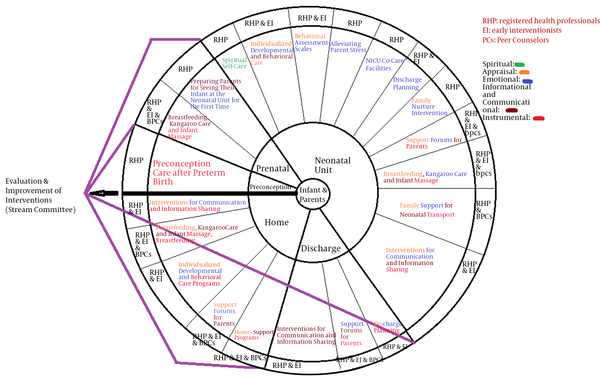 In this model, infants and parents are at the center of the support model who should be supported in critical stages of transition, including preconception, prenatal, NU, discharge and at home (second circle); the next circle consists of interventions which can be provided at this stage and can have an impact in various areas, including emotional, informational, instrumental, appraisal and spiritual support; Preconception: care before the next pregnancy and after delivery; Prenatal: preparing parents to see their baby for the first time in the NU, supporting parents in BF, KC and infant massage; Neonatal: spiritual self-care, individualized behavioral and developmental care programs, using scales to assess children’s behavior, supporting parents in BF, KC and infant massage, support forums for parents, relieving parents’ stress, sharing information and communication, family nurture interventions, supporting parents in transferring between NU, facilitating collaborative care in NU; discharge: discharge planning, support forums for parents, sharing information and communication and home: home support programs, individualized behavioral and developmental care programs, supporting parents in BF, KC and infant massage, support forums for parents, sharing information and communication. The next circle represents executive agents of these interventions which include experts, early interventionists and peer counselors; as shown in Figure 1, the guiding committee monitor and evaluate all the steps and pursue their modification by getting feedback from the implementation of various steps and interventions. After holding the panel of experts at three levels of mothers, experts and specialists, all the interventions acquired 60% of the total scores and remained in the system (Tables 1 and 2). In recent decades, family-centered care has been accepted as a key concept in neonatal services with the aim of putting parents and family at the center of health care and promoting the flexibility and individualization of the care. Close collaboration between specialists and family members in infant care is a principle in the family-centered care and five key features of this approach include: mutual respect between specialists and family members, participating in care and decision-making process, open and unlimited communication to address the concerns of parents, focusing on family strengths, acceptance of individuality and differences between people and recognition of family as a specialist regarding infant care (6). Evidence shows that this approach makes the parental experience more pleasant and results in better outcomes in parents and infants. Despite the emphasis on family-centered care, its implementation is challenging. Although the reasons are not explained clearly, some known reasons include: organizational factors such as human resources, priorities in the launching programs, culture of maternity services in various units, including NU, availability of resources and the need for long-term commitment in providing services for infants and their families. Researchers have recently begun to conduct systematic researches to evidence-based practice. Although, parents are included on the map of family-centered care, the level of their involvement in the synthesis and development of the model is not crystal clear (4). Based on our study, the experiences of Iranian parents indicate that offering non-family-centered care has had negative effects on them and their families. In this study, we tried to examine family-centered care afresh. Our goal was to understand what parents expect of family-centered approach and practices with applying strong research evidences. Identifying what kind of help is more useful for parents is difficult because the needs overlap. Therefore, it is essential for experts to cover a wide range of needs by providing multidimensional support as much as possible. This is the case that in the design of our proposed system, identified needs of parents in different areas were considered. The use of different interventions in support model designed by Brett and colleagues was also taken into consideration. In comparison between our study and the model study, POPPY, there are some similarities and some differences; If we compare our study with other models such as POPPY (1), we see that there are some similarities and some differences; clear basic evidences of our study is one of these similarities, because our design was based on a qualitative data and systematic review of evidences. User participation has become an integral part of health care research; user participation in the development of research provides a golden opportunity for the research to be more effective (7). Engaging parents as the authoritative research partners will help developing a model which is relevant and appropriate to the needs of parents (6) and, the other similarity between our study to poppy model is the use of this potential. In our proposed model, in line with the principles of family-centered care, parents and children are at the center of attention that should be supported through different interventions. This system is designed closed to show that frequent and periodic health assessments should always be sought to determine whether the type and proportion of provided supports are in line with the needs and views of the parents or not. Successful implementation of our proposed model requires organizational commitment and interaction of experts, peers and parents and also the organization that is responsible for providing care, must have family-based policy and education. Also, we should note how infants, parents and their families experience the services which means establishment of regular communication between multi-disciplinary systems of cooperation of parents for sharing ideas, guiding policies and getting feedback from them through polite queries. Although our study was conducted in Iran, international research evidences through systematic review were used for its implementation; different countries can test our proposed model in their country. Through addressing expectations and needs of parents more effectively and providing better care to infants, this model can help the infant services in every country to become a more family-centered model. Regarding the strengths of this study, it is noteworthy that one of the strengths of this study is the fact that we attempted to design all the components of support system with an evidence-based approach; on the other hand, interventions to enhance adjustment of parents with premature infants have not developed along with the rapid development of technology for the survival of these babies; among different interventions which have been tested on parents, most of them begin at the time of discharge or shortly after that; when the negative consequences of parents' mental health have changed parents’ understanding of their baby and when inefficient patterns of parent-infant interaction were formed (8). In this study, we tried to begin supportive interventions as early as possible to minimize negative consequences. In the end, it is suggested that issues of supporting parents should be entered into the students’ curriculum through constructive and evidence-based dialogue. Also, considering that mothers’ performance in infant care is the result of a bilateral interaction between them and their husband, it is recommended to conduct a similar research on fathers. We would like to gratefully thank all researchers that we used their studies in this meta-synthesis research and student research committee of Shahroud University of Medical Sciences that provided the possibility of access to full text of articles. Ethics approval: The article is extracted from the study that was approved by ethics committee of Shahroud University of Medical Sciences with ethical code: 930.24. Funding/Support: The present article was extracted from the PhD thesis (code: 9339) written by Seyedeh Saeedeh Mousavi and was supported by grant from student research committee of Shahroud University of Medical Sciences.